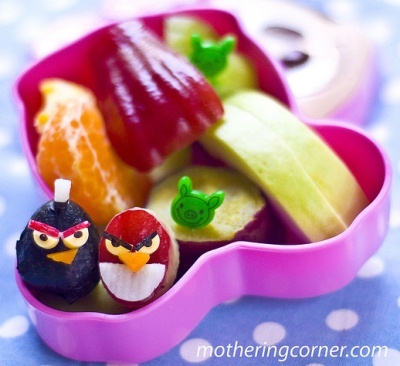 More Cute Angry Birds Bento ideas!! The first one are cute mini square sandwiches, and topped the decorations on the bread. The red is made from imitation Crab and the black is made from nori. The second bento has a quail egg wrapped in nori and decorated it as the black angry bird. The red angry bird was cut from rose apple. 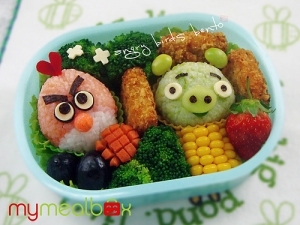 Such creative unique bento ideas that were graciously shared by Shopping Mum! Bento Box Ideas are so cute!! 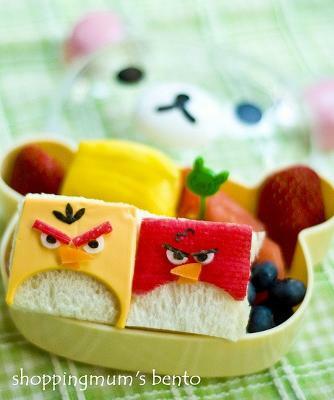 Here are some cute Angry Bird Bentos that would be wonderful for any party. For the red bird, white rice was mixed it with tomato sauce. The bird also had white color on the bottom part of its body, so white rice was added on the bottom. Cut baby carrot for the beak and cut red pasta sheet for the feather on top of its head. For the green pig, white rice was mixed with edamame and peas paste to make green colored rice. Edamame (soybeans) for the ears and a slice of cucumber for the nose. Like the red bird, nori and cheese slices to make the eyes and the eyebrows. Special thanks to Lukman from My Meal Box for allowing us the use of his cute bento pictures! Be sure to check out this site for other really neat ideas!! Wouldn't this be the cutest idea for an Angry Birds party?! 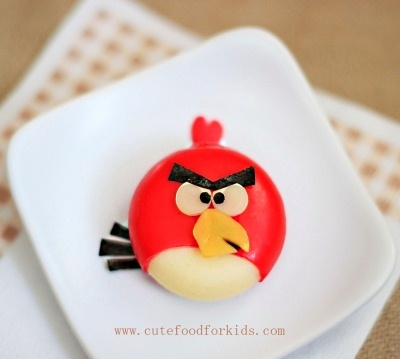 Turn a Babybel cheese into a red angry bird. This Angry Bird is made from Babybel Cheese, Swiss Cheese, Cheddar and nori (use fruit leather or olive if you have trouble finding nori). Nori which is dried seaweed, can be found in larger grocery stores in the Asian department. This Angry Bird is not difficult to make, but it will take time to cut all the little pieces. Thank you Tiffany for giving us permission to use your photo!